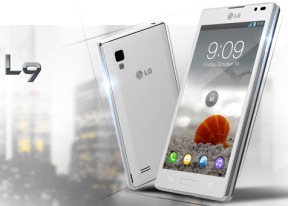 The LG Optimus L9 comes with a wide range of connectivity options. It has quad-band GSM/GPRS/EDGE for global roaming and dual-band HSDPA with 21 Mbps of download and 5.76 Mbps of upload. Wi-Fi is has a/b/g/n support, DLNA, Wi-Fi Direct and Hotspot capabilities. There is NFC and Bluetooth 3.0 too. If you connect your phone to a computer via an USB cable a few options will pop up - charge only, media sync (via MTP protocol), USB tethering (to share your internet connection), LG Software mode or camera mode (using the PTP protocol). The last connectivity option worth noting is the 3.5mm audio jack on top of the Optimus L9. The user interface is completely minimalist (it's the Google way). All you get on the screen is an address bar on top and a control bar at the bottom (with options hidden by default). The address bar is placed on top of the page, so scrolling down moves it out of view. The bottom control bar houses the back and forward keys, zoom shortcut, and the new window and bookmarks keys. By default it's hidden and you need to swipe the small visible gray line up to evoke it. It doesn't auto hide, instead you need to swipe it down manually. The Optimus L9 supports double tap zoom and pinch zoom. There's text reflow too - it adjusts the columns of text to fit the screen width. If you've pinched to zoom in, you need to double tap the screen to make the browser reflow the text. Since Adobe pulled the plug on the Flash for Android you can't find the installer within the Play Store. Of course, you can get the apk from XDA Developers or other place and install it by yourself. The Optimus L9 hardware is enough to handle most of the available Flash content on the internet.